Sign Aaron Williams Music mailinglist and immediately get a free MP3 and receive monthly newzletters. 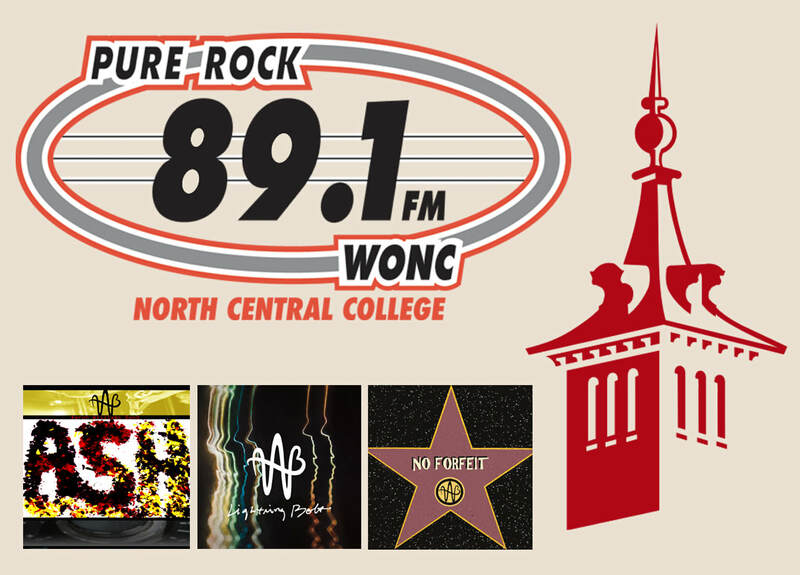 04/15/19: Skyline Concert Series "NEWZ"
03/18/19: Elmhurst College Radio Interview / Performance "NEWZ"
03/03/19: Aaron Williams Music "NEWZ"
SUN March 10th LIVE on Pure Rock 89.1FM WONC w/ DJ Demi Proutsos at 8PM - 10PM. Spinning my original songs ASH, LIGHTNING BOLT, and NO FORFEIT, plugging the upcoming performance at Jimmy's Grill on March 23rd, and performing original song EVERWINDING ROAD live on the airwaves. Tune into 89.1FM at 8PM. Kane / Will / DuPage Counties can all listen. VOYAGE CHICAGO did an interview about my music career as part of their upcoming March edition. Huge honor to tell my story in some depth and reflect on a 20+ year career promoting and contributing to our the rich music scene. Had the opportunity to discuss Mr Hendee's English class, Homegrown Fest, the films I've contributed to, My albums, and more. Thank you very much to Columbia College dorm-mate Sara Graves for nominating me, I had a lot of fun doing this! Please give a read, THANK YOU! Brian Shamie at the Daily Herald released Chicago Sound Check 2019 playlist on #Spotify featuring new releases from our area's best local acts. Aaron Williams Band's new single NO FORFEIT streams alongside some top local musicians like AM Taxi, Friday Pilots Club, and many more. Go ahead and support local music and enjoy this great playlist. FRIDAY Feb 1st @ 9PM playing live at Jimmy's Grill. Performing covers along with original songs ASH and NO FORFEIT. Giving away free CDs at the show including those original songs. Jimmys is right in the heart of downtown Naperville. 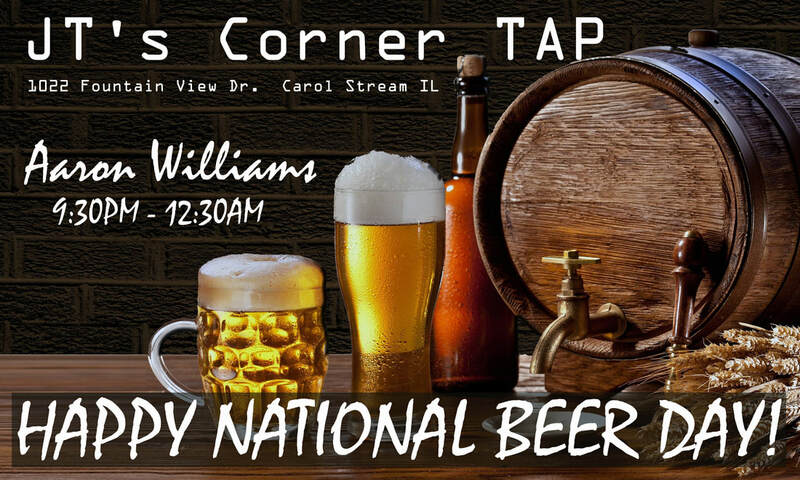 Have a drink or dinner and enjoy LIVE music. Listen to "WAPL Home Brewed PODCAST - Episode 1.26.19" on Spreaker. 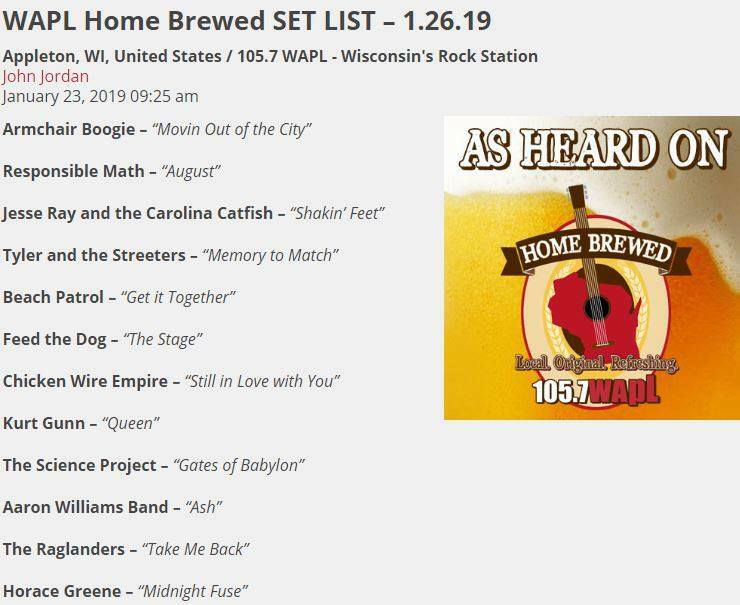 "ASH" will be apart of 105.7 WAPL Home Brewed Radio SAT Jan 26th along with many Wisconsin original musicians/bands. It will then be a part of their regular rotation. New ORIGINAL music in film coming in early 2019. NO FORFEIT produced by Johnny K Productions will be included in the upcoming Video Girl pro documentary "The Dream Film." OCEANS from the film Heavens to Betsy 2 - A Robert Alaniz Film (starring Karen Lesiewicz, Steve Parks-Actor and Jim O'Heir) will also be unleashed. To top it off, "Mind Over Mindy" will be released on DVD featuring AWB original song OH MINDY. Excited to release new music this entire year to coincide with the return of Aaron Williams Band. Monday January 7th. First performance of 2019 after hustling 112 gigs throughout 2018. Excited to return for cocktail happy hour at Hampton Social Chicago (Streeterville) from 5PM - 7PM. Free and one of the nicest atmospheres in the city to have a drink and enjoy some live music. 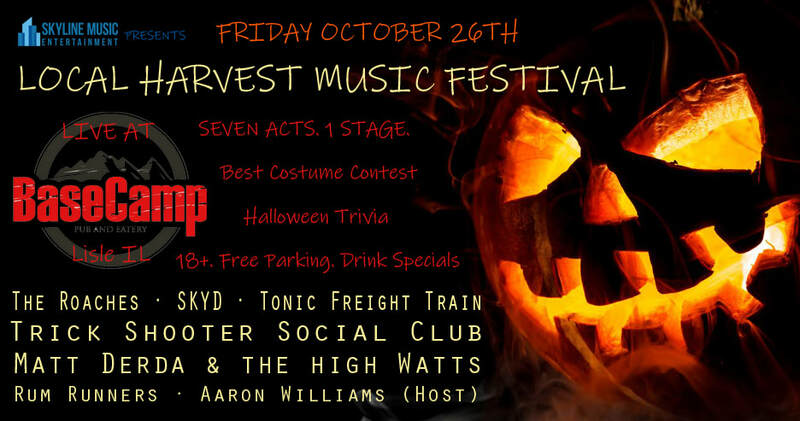 A Halloween celebration with best costume prizes and trivia Featuring six of the most talented and hardworking locals bands from DuPage County. 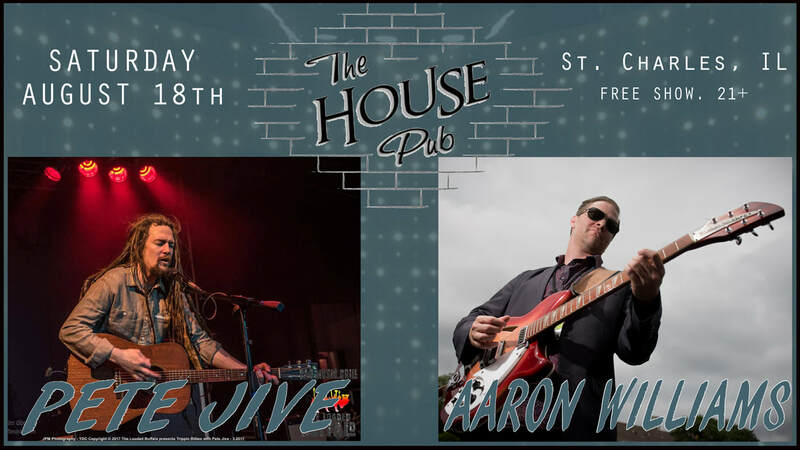 Tomorrow night is the debut performance at The House Pub in St Charles. Very excited to share the stage with my pal Pete Jive Music. Debuting new original tunes and cranking out favorite covers. Swing by for a drink, its a FREE show! Show starts at 9PM. I'm on from 10:30 - close. This Sunday morning, July 15th between 8AM and 9AM. Music columnist for the Daily Herald Brian Shamie and I will be LIVE on the ABC 7 Chicago morning show for a segment on this year epic 6th annual Homegrown Arts and Music Festival 2018. Both Brian and I work hard to give talented ORIGINAL musicians from Chicagoland exposure and opportunity. Here we get to extend our passion and these bands to all of Chicago! Also, keep your eye out this Sunday for our annual spread in the Daily Herald featuring an interview with the festival's founder, photos from most the acts playing, and one lucky band sitting on the COVER. Who will it be? This is a huge for the festival and a huge moment for ORIGINAL local music. Fighting the fight for the talented people of our community and I'm very excited to share the passion tomorrow morning with all of Chicago. The biggest celebration of ORIGINAL music and art in Chicago's Suburbs is next weekend Saturday July 21st at BaseCamp Pub & Eatery in Lisle IL and also, tune in this Sunday July 15th on Channel 7 on ABC. 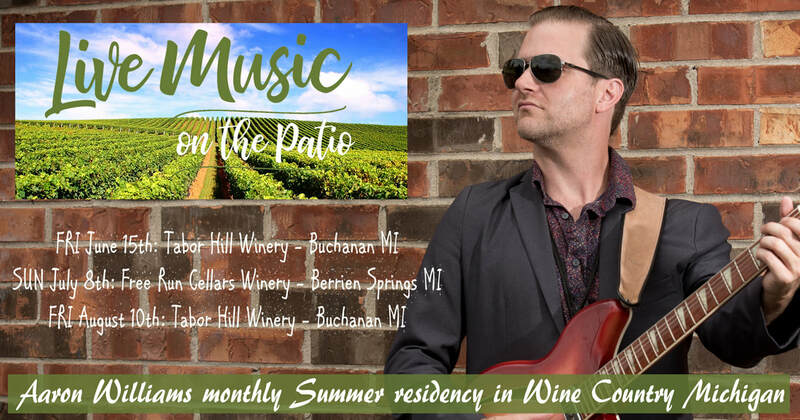 Excited to announce my summer monthly residency in Michigan wine country. Three performances this summer on the patio humming and strumming covers and originals to the summer travelers enjoying a glass and great food. These shows are free to the public and details are on the event pages. 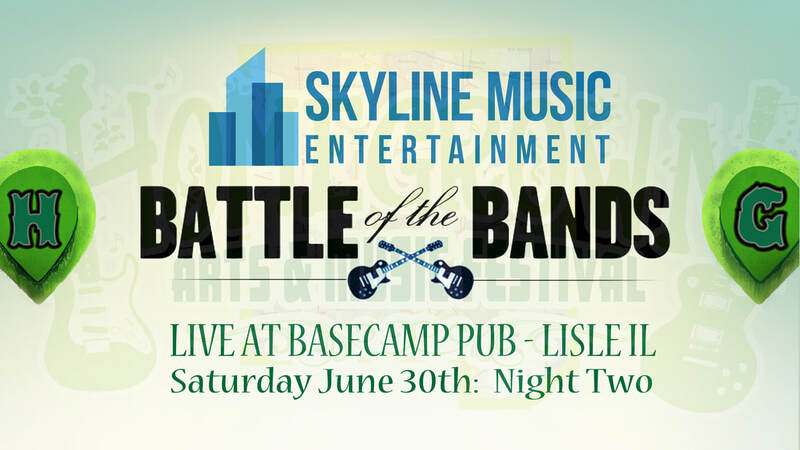 05/28/18: Skyline Entertainment "Battle of the Bands"
​Hosting the "Battle of the Bands" at BaseCamp Pub & Eatery on June 29th and 30th featuring 5 talented bands each night performing for a chance to win a slot at this year's exciting 6th annual Homegrown Arts and Music Festival 2018. 2 winners will be based on crowd reaction and a panel of Judges from our music scene. 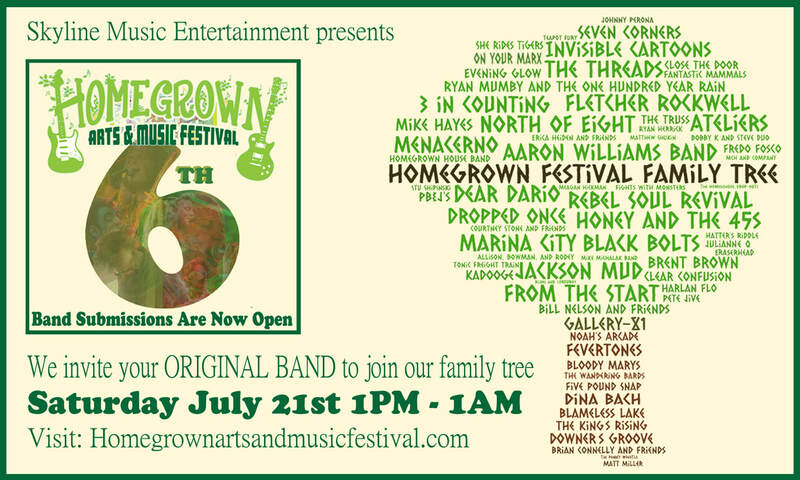 Come support your local music community and root in your favorite act of the night into the Homegrown Festival. Tickets On-Sale now off the event pages. RSVP and Please Share~! Had a great rehearsal last night for our big performance this Sunday at Taste of Glen Ellyn from Noon to 2pm. We will unleash our music from the upcoming album The Ex_Files plus a handful of covers and other originals from our solo albums. See you May 20th in DT Glen Ellyn! 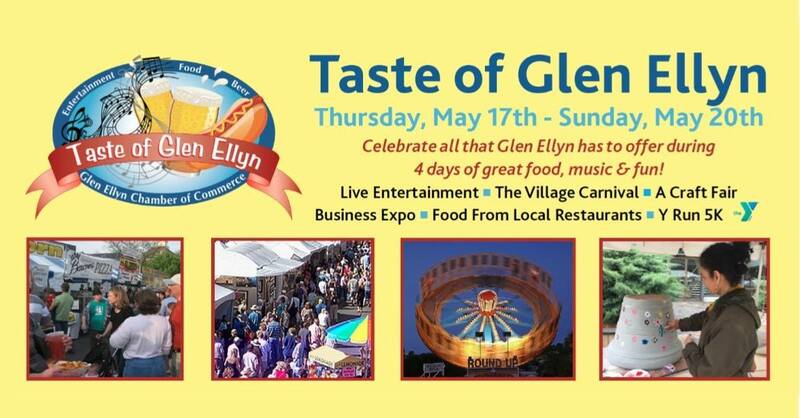 ​Aaron Williams and Michael C. Hayes will be performing the Main Stage at this year's Taste of Glen Ellyn on Sunday May 20th from Noon to 2PM. Showcasing songs from the upcoming album The Ex_Files along with my single ASH (now streaming on Spotify). We will be joined by some amazing musician friends including Matt Psenicka (Drums) and Bob Koutek (Bass) of North of Eight. This is going to be an EPIC performance because I've been trying to get this gig for.....well lets just say a very long while. Please spread the word around town and mark your calender's for May 20th. Show is FREE! Skyline Music Entertainment presents LIVE at BaseCamp Pub & Eatery featuring the best ORIGINAL artists from Chicago’s Suburbs. this FRI night ​ features Danny Mazz - D-CLASSIFIED - Social Que with opening acoustic set from your host. All starting at 8:30PM. Come Support local music! 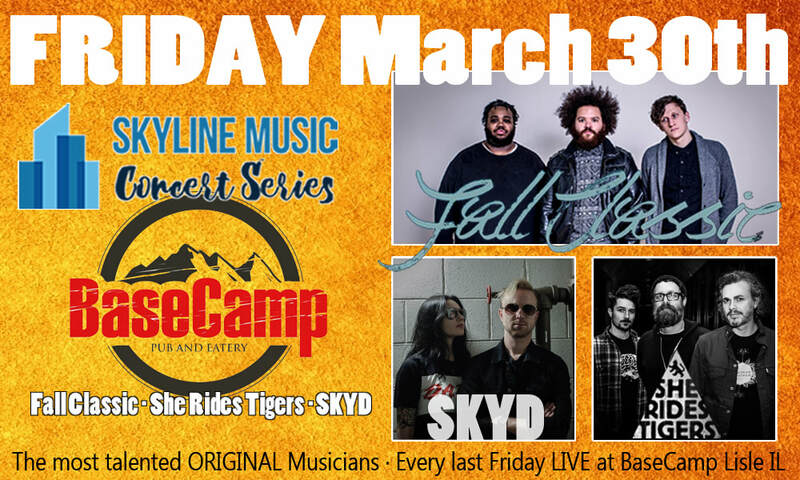 This GOOD Friday is a GREAT night to get out and support original LIVE music at BaseCamp Pub & Eatery for the Skyline Music Concert Series featuring Fall Classic · She Rides Tigers · SKYD · Aaron Williams. Acoustic set by your host starts at 8:30PM. Top Of The Morning! 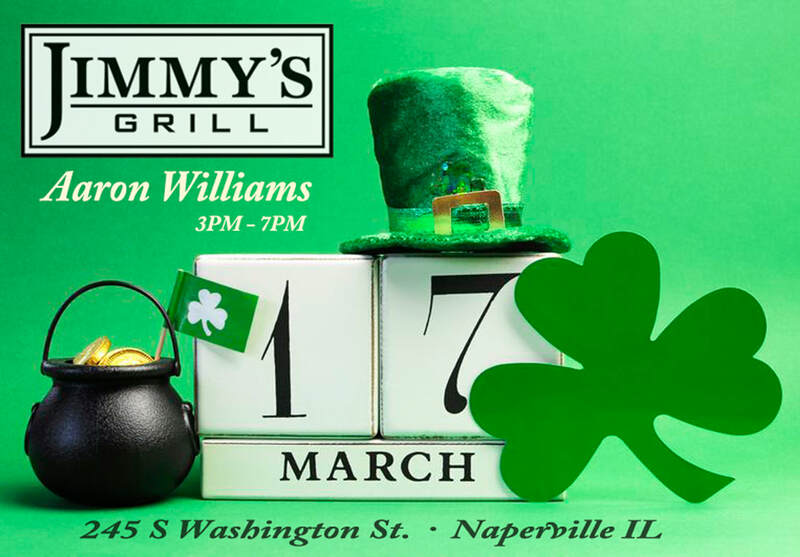 This Saturday on St. Patty's Day I'll be playing in DT Naperville IL at Jimmy's Grill from 3PM - 7PM. Four hours of the best rock, country, blues and Irish sing a long songs from the genre's most profound performers including this traditional protest fight song "Get Out Ye Black and Tans." 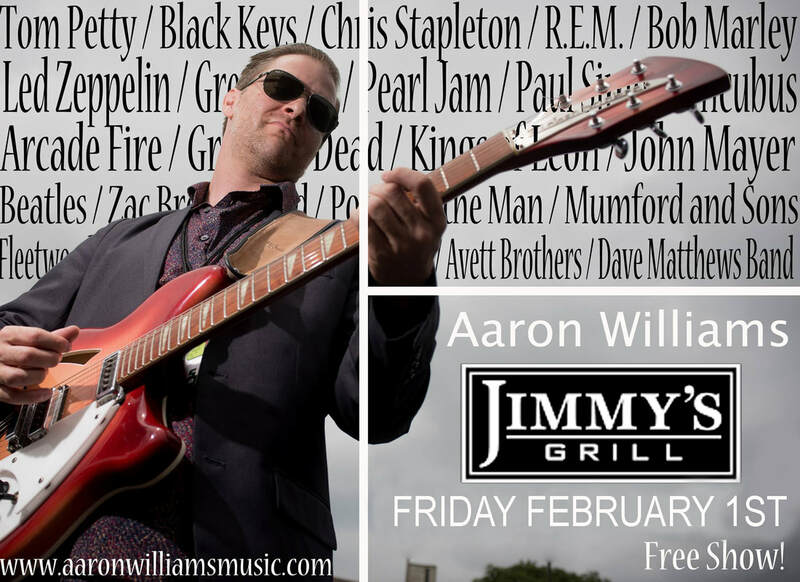 ​Aaron Williams Band new single ASH is included on the CHICAGO SOUND CHECK #Spotify playlists for the Daily Herald's Brian Shamie. Humbled to be included in such great company of talented local musicians including a couple of Homegrown alumni including 7 Corners, Over The Sun, Bury Me in Lights, Blameless Lake, ABOVE WAVES, David Paige and many more. 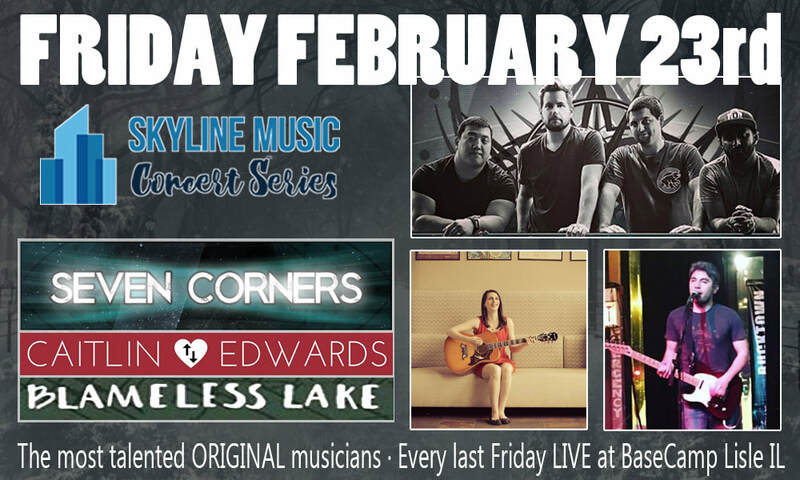 7 Corners · Blameless Lake and an opening acoustic set from your host performing my new single ASH. 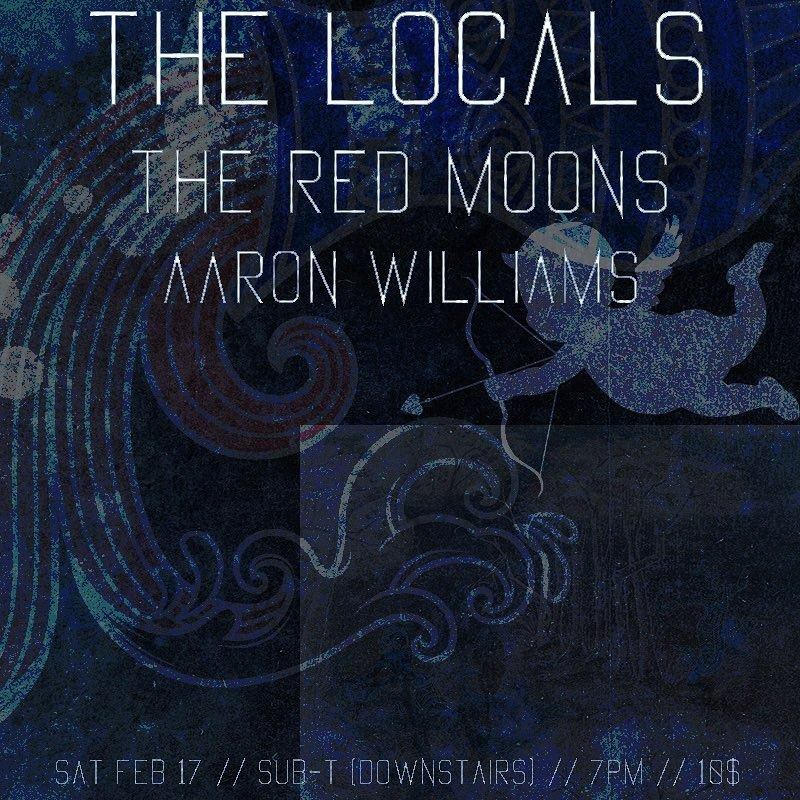 Performing my first show in Chicago in a long while for an exciting opening slot at Subterranean with The Locals and The Red Moons this Saturday night. Breaking out tunes from the forthcoming album The Ex_Files along with AWB singles Ash and Lightning Bolt. Its been a prolific winter so maybe some brand new tunes as well. Does your band perform ORIGINAL music? Would your band like to join the biggest celebration of ORIGINAL local music in Chicago's Suburbs? Our goal is to give the talented artists of Chicagoland a platform to bring your music to the 1,000s of new fans from our local communities. In an over saturated Chicagoland music scene full of covers bands Homegrown Arts and Music Festival is the fight and platform for your ORIGINAL music! 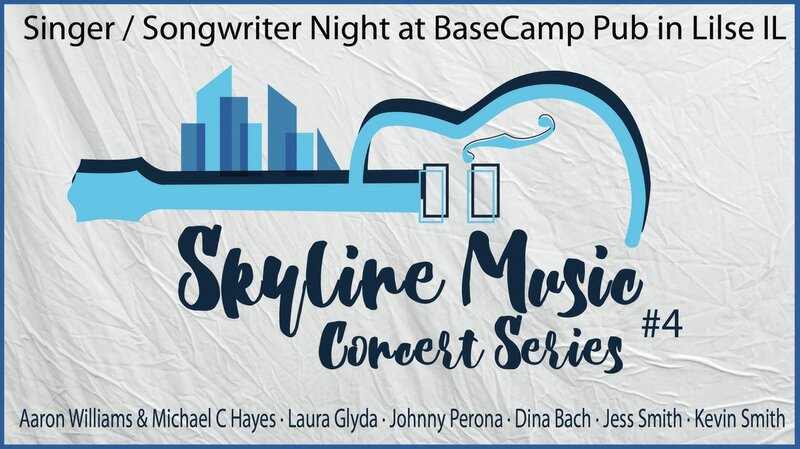 Skyline Music Concert Series continues throughout 2018 at BaseCamp Pub & Eatery! Showcasing the best ORIGINAL bands/musicians from Chicagoland LIVE every last Friday of every month. January features From the Start and The Feral Ghosts with opening acoustic set from your host. 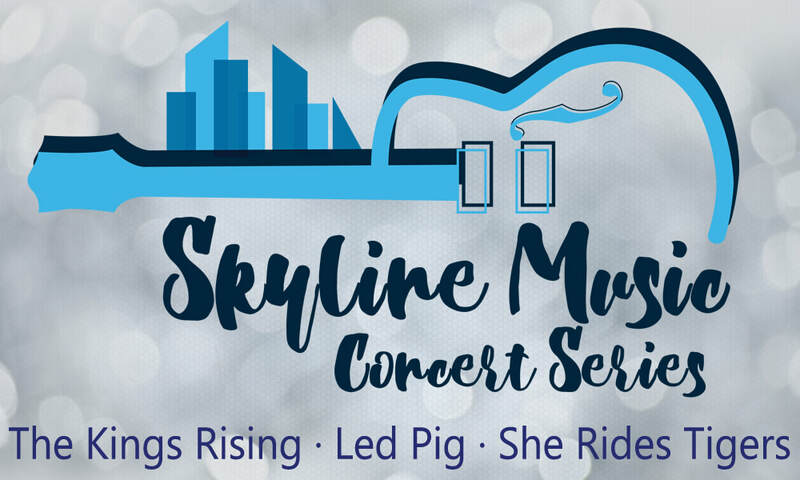 Come join us for tonight's great ORIGINAL music and stay tuned for exciting events coming up in the near future for Skyline Music Entertainment. Releasing NEW single ASH early February on all digital and steaming outlets including iTunes, Amazon, and Spotify. 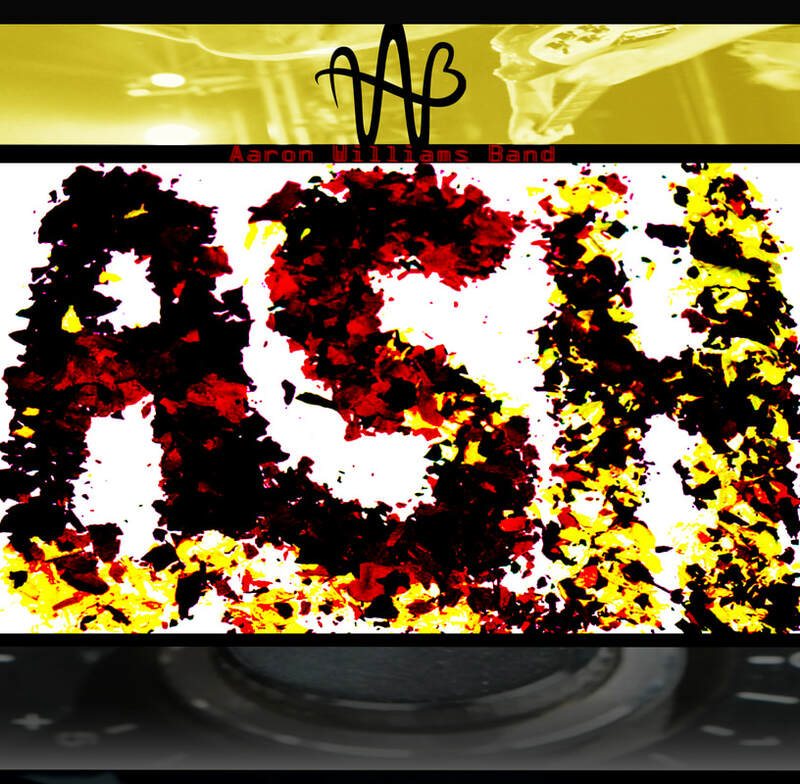 ASH was recorded at Groovemaster Studios and produced by Johnny K Productions (Lucky Boys Confusion / Plain White Ts / Three Doors Down) for the album The Art of Electricity. This will mark the first time ASH will be available for download or stream and will be accompanied by an exclusive bonus track. Date Announced and Submissions open Monday February 5th. 2018 is certainly a year of promise for local ORIGINAL bands. Skyline Music Entertainment is at the forefront in the battle for the now famous and growing music scene of ORIGINAL artists in the West Suburbs of Chicago. The once over looked part of the Chicago-land music scene. 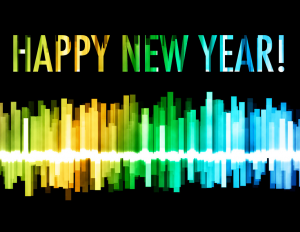 Here's to a great year ahead - ROCK ON! Back at Populist Studio this week working on the fourthcoming album "The Ex_Files." Putting some detail into my favorite tune I contributed to the project "Atmosphere." This album is getting close and it'll be unleashed very soon! 8 New original songs by myself and Michael C Hayes. 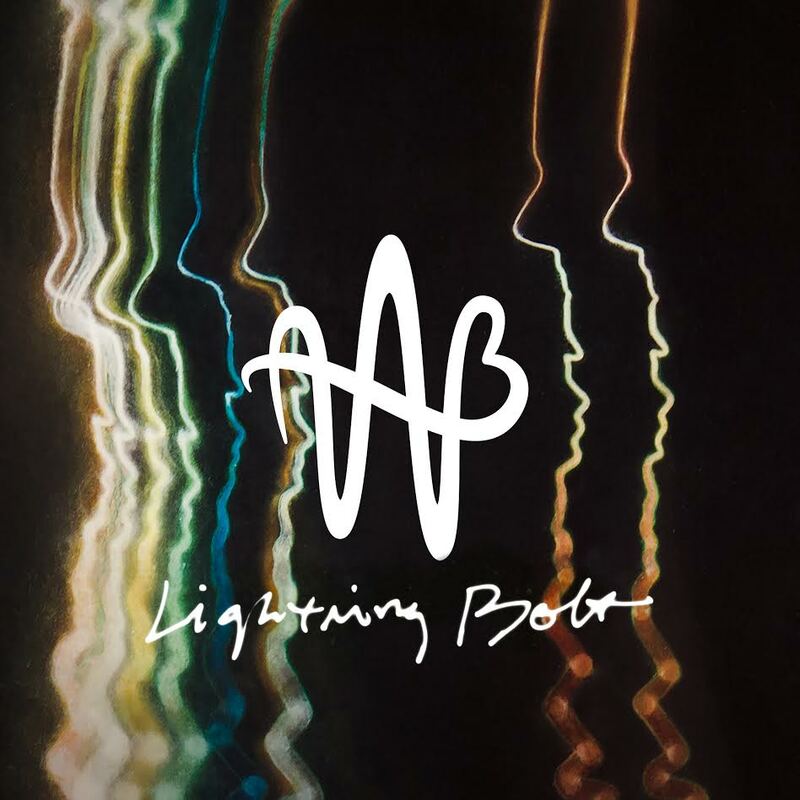 AWB's single "Lightning Bolt" is included on the yearly round up "Sounds of Chicago" on Spotify and Soundcloud by Chicago Music Guide. Listen to the hour long stream featuring Aaron Williams Band and 16 more talented bands/musicians including our friends in Eugeine Grey and The Bad Habits, Voice Of Addiction, and Drownbeat. Mind Over Mindy - A Robert Alaniz Film is getting a DVD release this Winter! The music video for the award winning song "OH MINDY" (written for the film) will be included in the DVD extras. MIND OVER MINDY stars Steve Parks, Ann Hagemann, and Catherine McCafferty along with TV stars Larry Thomas (Soup Nazi from Seinfeld) and Jim O' Heir (Jerry from Parks and Recreation). 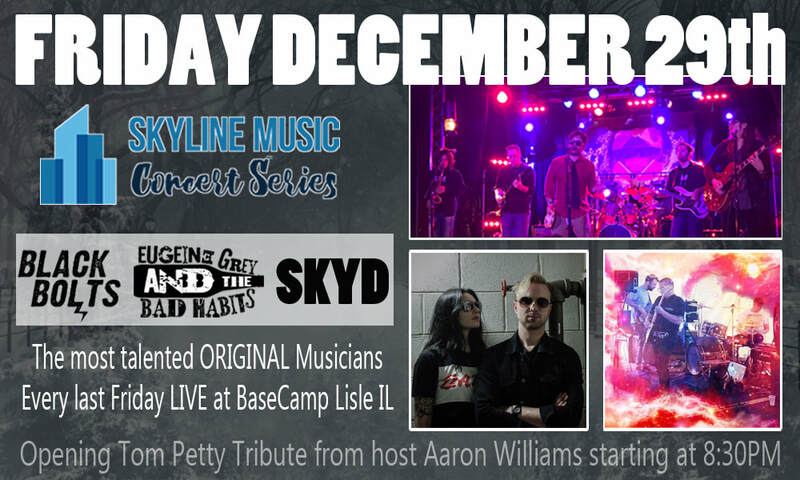 Post Christmas concert event featuring the best ORIGINAL BANDS from Chicagoland plus opening Tom Petty tribute by your host. Article by Brian Shamie in Daily Herald. Selfie and the Photobombs DUO features Aaron Williams along side the incredible vocalist Courtney Stone together humming and strumming the greatest songs ever written. We return to Glen Ellyn IL with our talented friends Steve Barnes and the Hazy Sparrow at our debut performance at Northside. Double Header Starts at 8:30PM this Saturday November 11th. 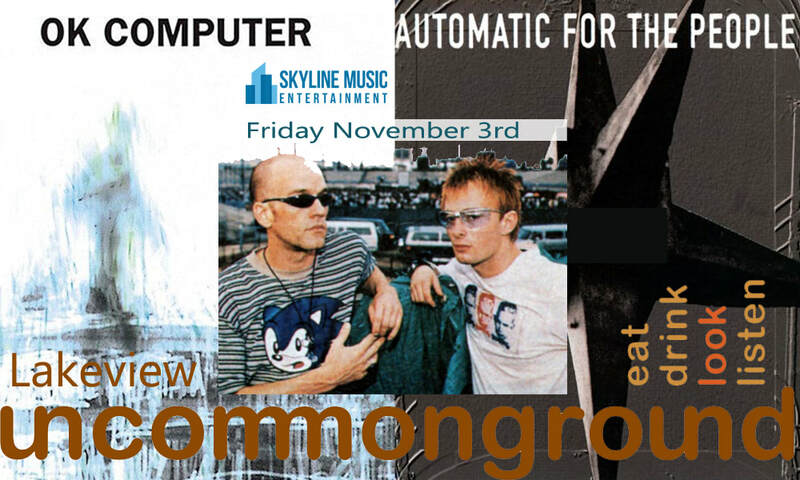 Skyline Music Entertainment presents at Uncommon Ground Lakeview Chicago on Nov 3rd. Tribute to TWO iconic albums of the 90's R.E.M. 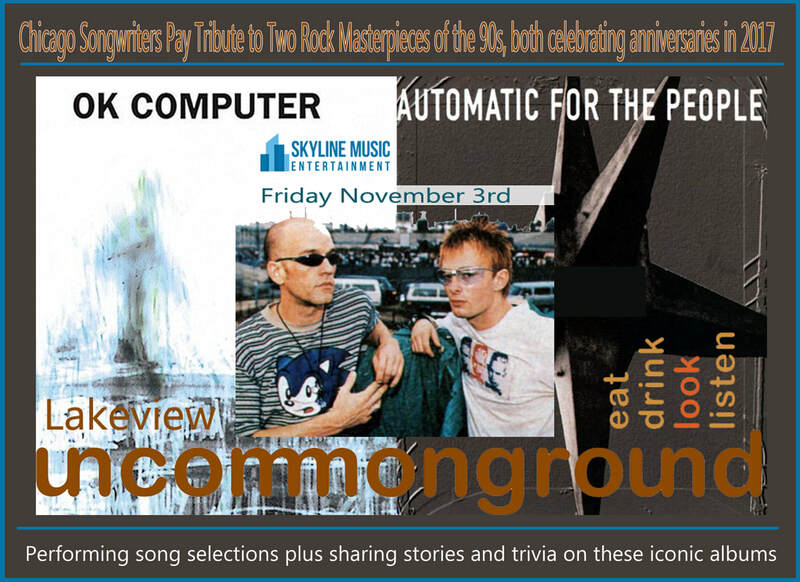 's Automatic For the People and Radiohead's OK Computer, both celebrating anniversaries this year. 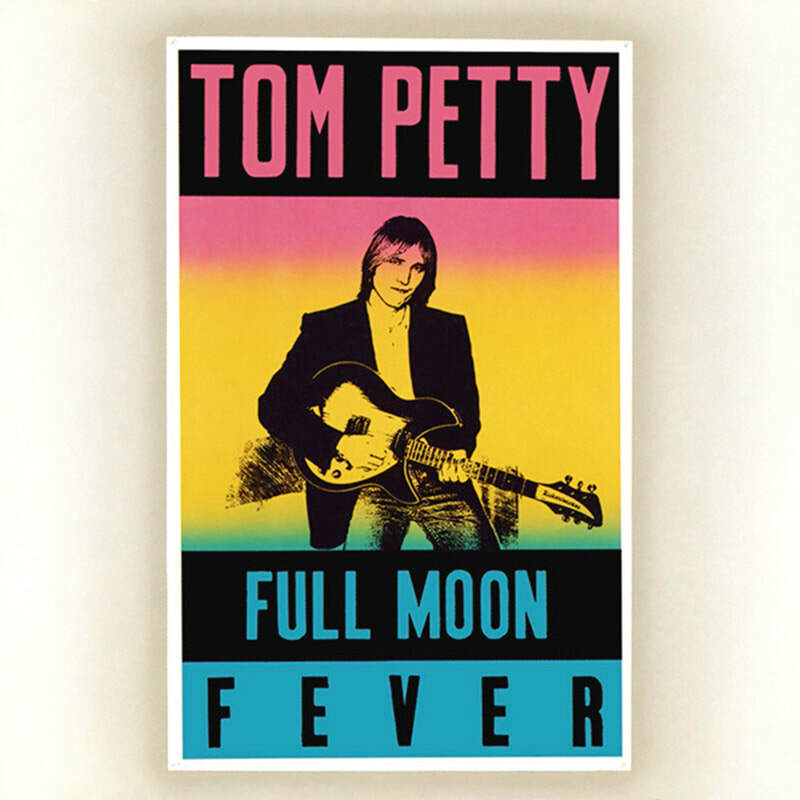 I and a handful of other musicians will be performing song selections, sharing personal stories, and asking trivia questions on both of these masterpieces in rock history. Tickets are available at the link, don't miss this one time tribute to these living legends of rock. 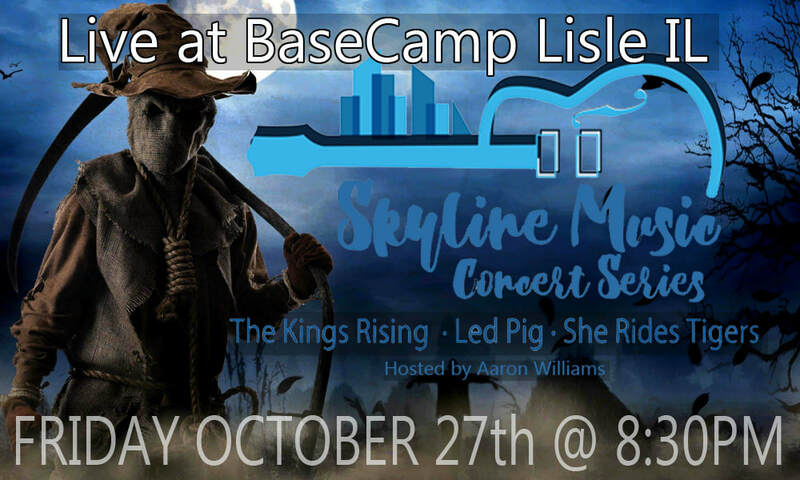 Skyline Music Concert Series presents ROCK-tober with The Kings Rising · Led Pig · She Rides Tigers featuring opening acoustic tribute to Tom Petty and the Heartbreakers by your host LIVE at BaseCamp Pub & Eatery. This is going to be a fun night of music and Halloween surprises. Come support the best local talent every last Friday of every month. 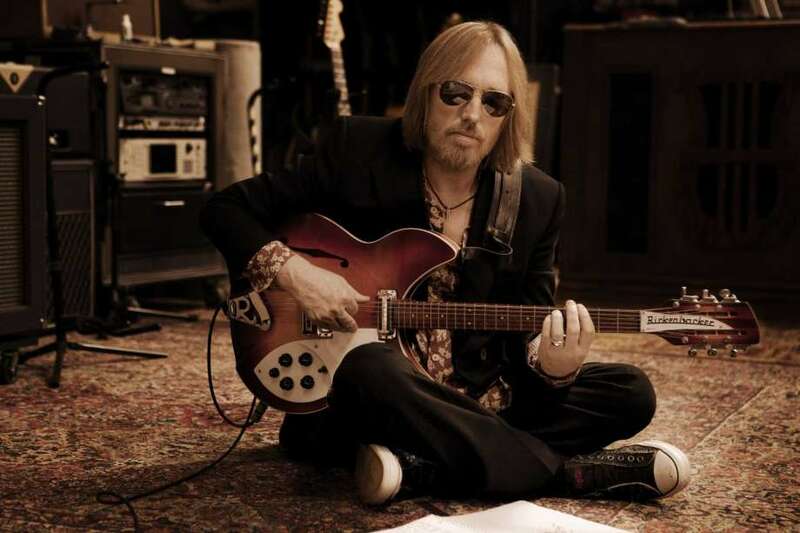 "Tom Petty you were a huge part of my life, personal and professional. So glad I got to meet you at The Vic Theater in Chicago fifteen years ago. I saw you a total of 10 times since Wildflowers Tour when I was only 15. You've impacted my life with every album you made before and since. Rest in Peace. Thank you for making millions of people believe in the power of the song". Performing at In Bloom Lombard Acoustic Fest Sat Sept 9th at 3:00PM at Balkan Bakery's outside patio. Dozens of songwriters playing all over downtown Lombard all day today. Not often I get to rock out acoutsic solo outside with so many talented friends, this is going to be fun. Breaking out tunes I usually cant play with the band and a few brand new songs written this summer. New single Lightning Bolt is being spun on Rock Rebel Radio's Tasting Room Show with Coren McLeod to promote upcoming concert at Cubby Bear Chicago on Sept 2nd. Selfie and the Photobombs are set to perform the world famous "Smallville" Superfest in Plano IL this Saturday at 5:45PM. This festival celebrates the iconic DC Comic Character, Superman. We have a great set planned full band. 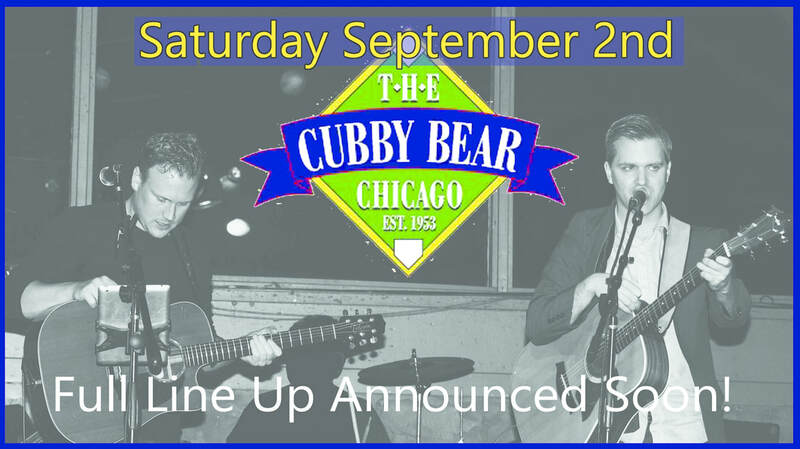 Just Announced: Aaron Williams and Michael C. Hayes live at Cubby Bear Wrigleyville Sept 2nd with special guests. This is our first concert in Chicago with our new project. Had a great show at Homegrown and excited for our city debut. I have pre-sale tickets and more details coming soon! Here's to another great Homegrown Arts and Music Festival. Thank you to 1,000 music fans, 100 musicians, and 15 art vendors for making year 5 the greatest one yet. Hope everyone had a fun and safe time, seemed like that is exactly what happened. Stayed tuned for photos and videos, ROCK! Spent Sunday being interviewed on the ABC Morning Show with Brian Shamie. Experience I'll never forget! After the interview I was shown the paper. Never been on the cover of anything before. 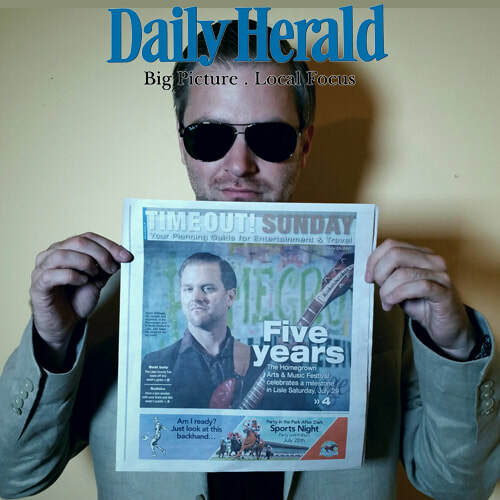 Thank you Brian and Daily Herald for this honor to represent ORIGINAL music in Chicago's West Burbs. Homegrown Arts and Music Festival is becoming an entity all its own. Here are the links to view the interview and read the brilliantly written article on the 5th annual Milestone by Mr. Brian Shamie that truly encapsulates this year's event. Thank You and see you SATURDAY! 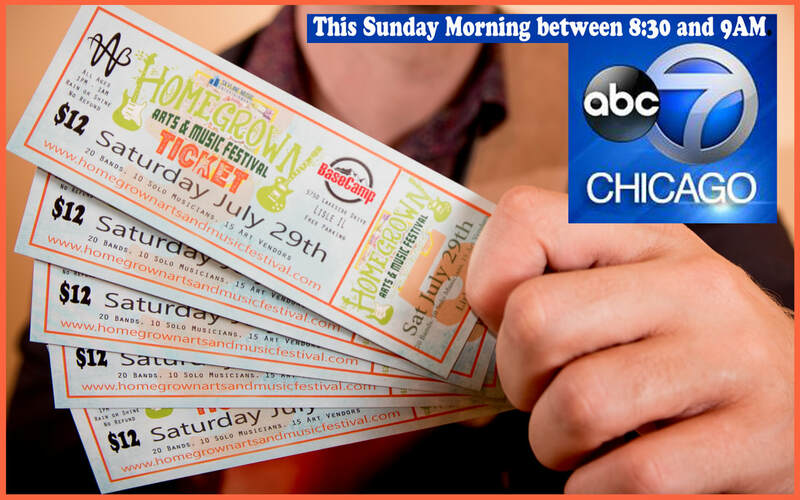 ​Daily Herald's Brian Shamie and I are going to sit down with ABC 7 Chicago Morning News (Channel 7) this Sunday July 22nd between 8:30AM and 9AM to discuss and promote 5th Annual Homegrown Arts and Music Festival 2017 to the greater Chicagoland area. Very grateful for this sensational opportunity to spread the word on ORIGINAL music from the West Burbs and our growing yearly celebration. Is there a huge celebration of original music/art happening in the West Burbs? 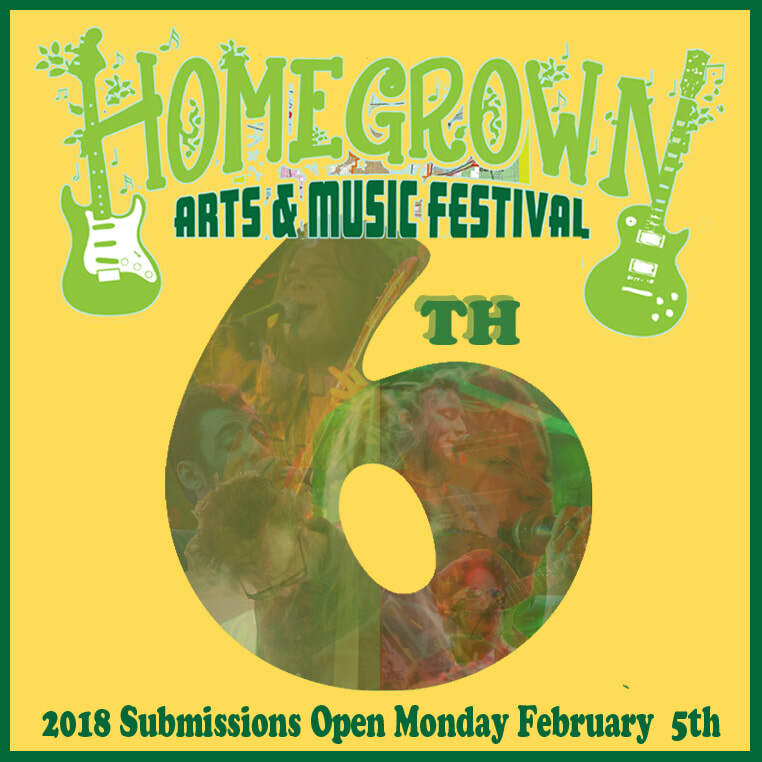 5th Annual Homegrown Arts and Music Festival 2017. 220 RSVP and over 550 Interested. 30K+ hits on our website in 30 Days. Event page has over 300 shares. 1,500 tickets are being sold by 30 acts. That's only the beginning, huge announcements coming very soon for the milestone 5th annual on July 29th at BaseCamp Pub & Eatery. Stay Tuned! 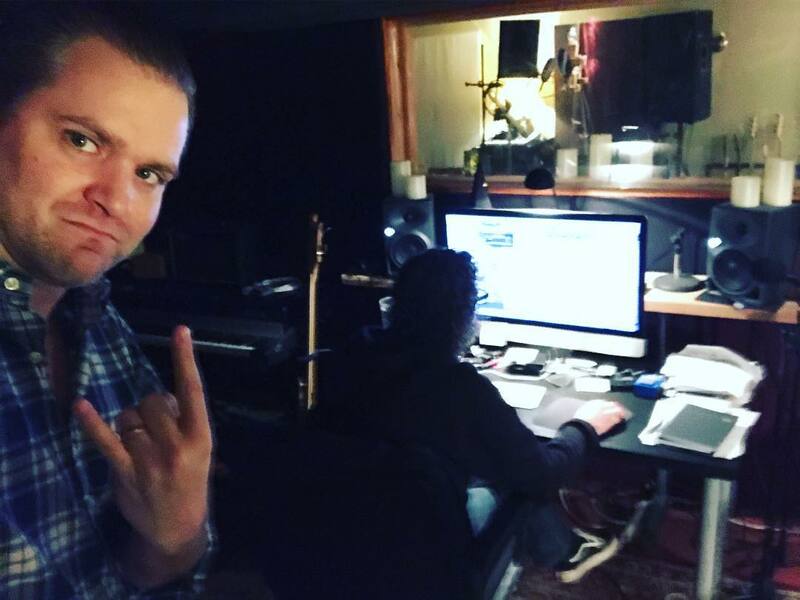 Michael C Hayes and I are working hard putting the finishing touches on our upcoming album "The Ex_Files." The first single "Always Have Your Back" is finished and ready for mixing as are a handful of others. Here I am laying down some string ideas ob the keys for my original songs "Sweet Chariot" and "Atmosphere" for our string duo to perform very soon. Writing string sections is challenging a lot of fun! 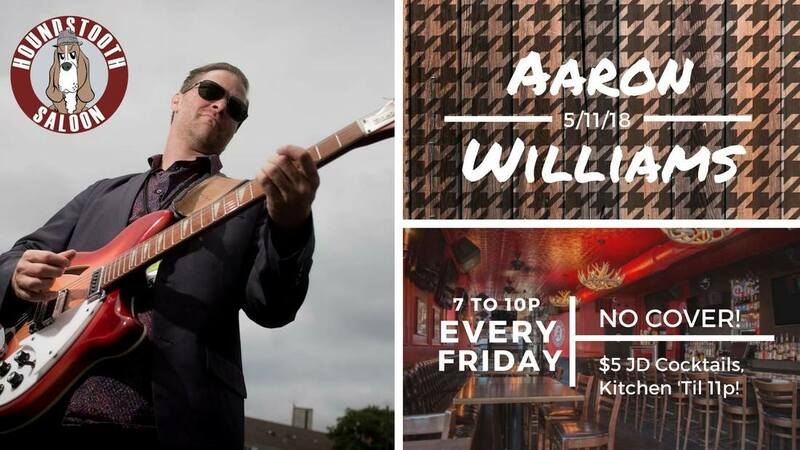 Singer/songwriter night for the 4th installment of the Skyline Music Concert Series #4 this Friday night starting at 9PM featuring a full band headlining set from Aaron Williams and Michael C Hayes. Live video performance of my new single LIGHTNING BOLT from WNIJ's "Sessions from Studio A" with Carl Nelson. Lightning Bolt's studio version produced by Johnny K is streaming on Spotify and available for download on Itunes. 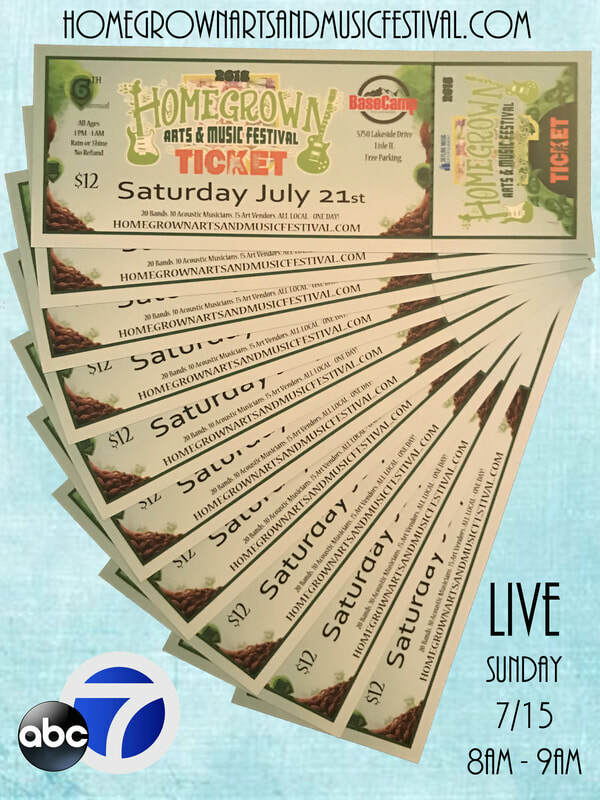 Homegrown is my yearly music festival celebrating local musicians and artists. 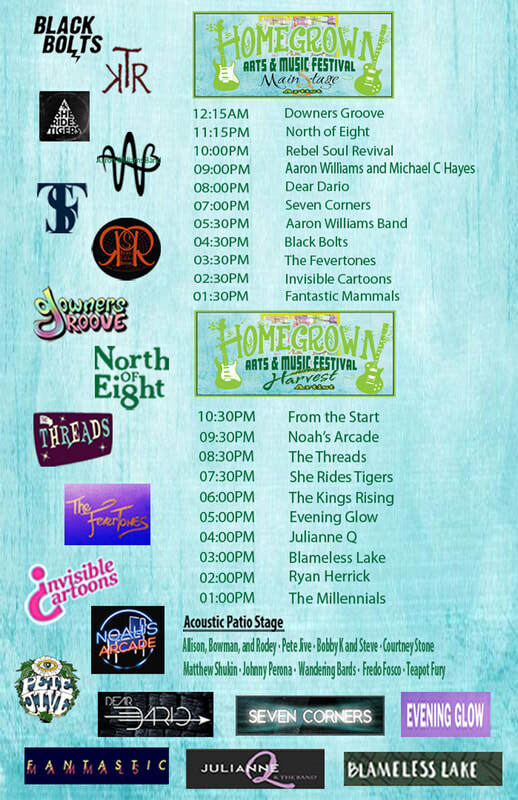 This year we have 30 acts on three stages, all from DuPage or close surrounding including my two projects Aaron Williams Band and Aaron Williams and Michael C Hayes. Two very creative bands names indeed. Click the button/link below for details. LineUp Announced · Tickets Onsale. Click here for more details. Aaron Williams' new single "Lightning Bolt" was spun on 101WKQK Demo312 show last night. Lightning Bolt is streaming on Spotify and available for download on ITunes. 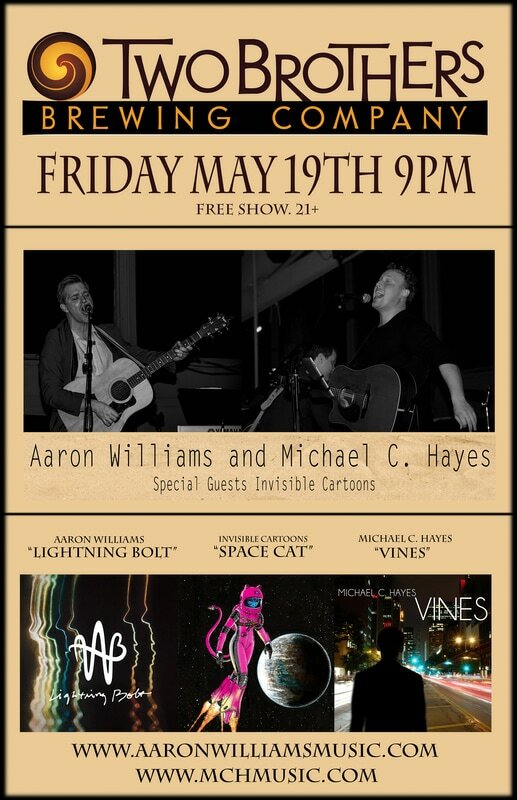 FREE concert Friday May 19th performing music from the upcoming album The Ex_Files at Two Brothers Roundhouse with special guests Invisible Cartoons. Releasing new single "Lightning Bolt" recorded at Johnny K Productions. 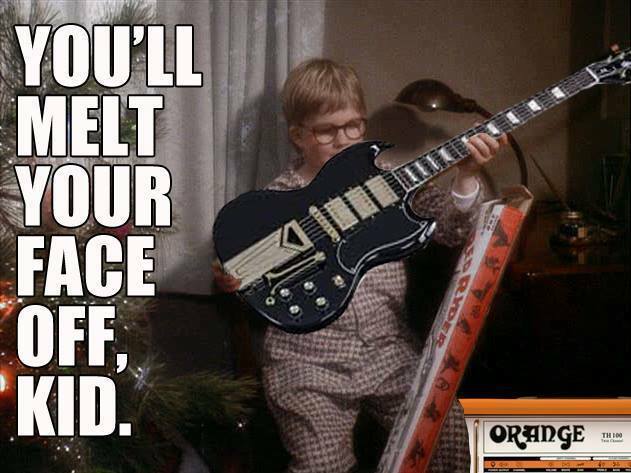 Its also the 25th anniversary of Wayne's World and we are playing in Aurora Illinois. Sure to be throwbacks all night, Chea! Homegrown Arts and Music Festival is announcing the lineup all this week 20 Bands. 10 Solo Musicians. 15 Art Vendors. 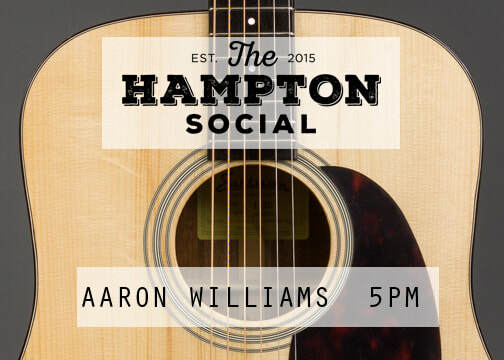 Including two performances by Aaron Williams with The Ex_Files and AWB. This is the first milestone and we have a great event planned this year. Releasing a new original song "Lightning Bolt" produced and mixed by the masterful Johnny K along with an upcoming concert at Two Brothers Roundhouse in Aurora IL with Michael C Hayes and Invisible Cartoons. Lightning Bolt will be made available on ITunes, Amazon, Spotify, and IHeart Radio. Stay Tuned. 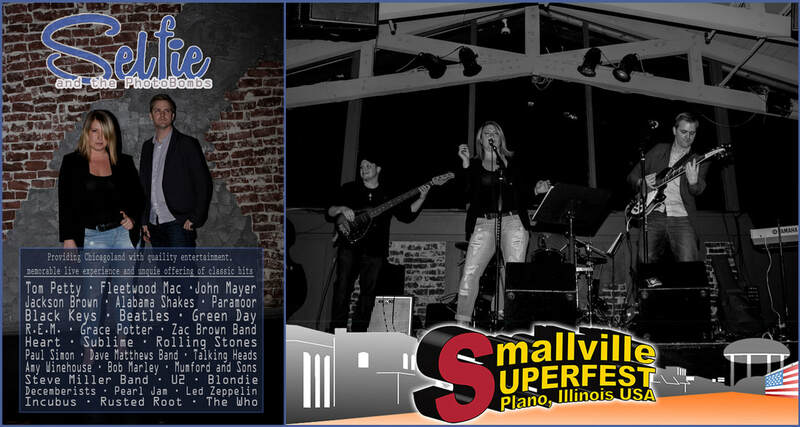 Skyline Music Concert Series this Friday April 28th in Lisle IL with some amazing talent. This showcase focuses on the hard working musicians from DuPage County performing and recording original music. ​Don't miss this rare chance to see four bands from our area. 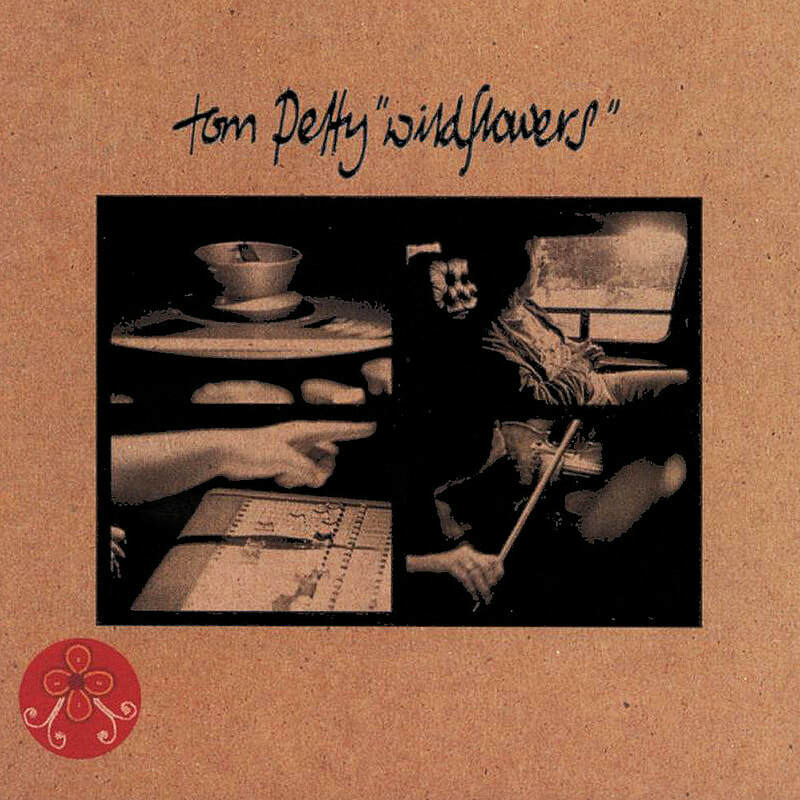 including "Lightning Bolt" and "Vines" mixed with some deep cuts from the archives (Zen Feat / Truss era). Very Special guests Invisible Cartoons will open the show. Free to the public · 21 and up. 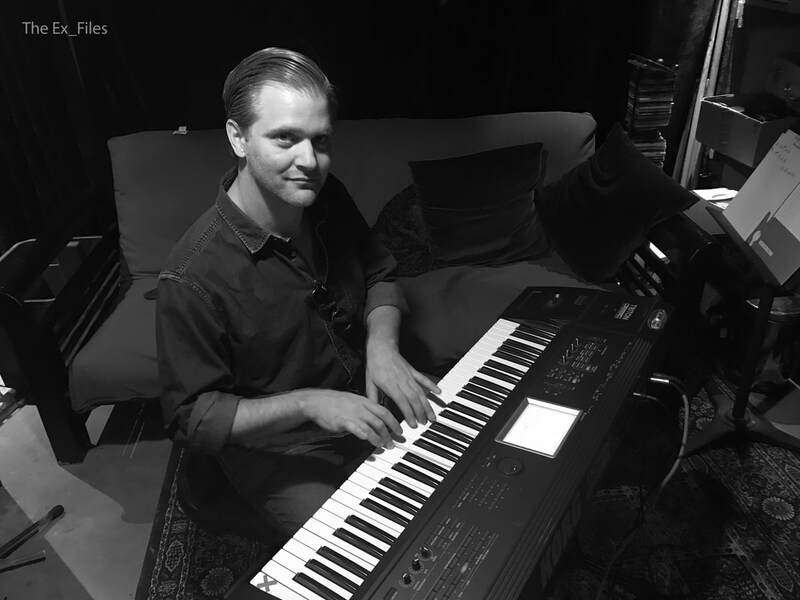 Aaron Williams Band's original song "Oh Mindy" written for the film Mind Over Mindy ,will be getting some coverage soon and is now streaming on Spotify. Two upcoming performances with my acoutsic cover duo, Selfie and the Photobombs. Shows announced for April including Chicago IL on April 8th with the incredible Courtney Stone. For more details (and to check out all of Selfie and the Photobomb's up coming shows), click the link below. Moving right along with the new collaborative album The Ex_Files. Mike Racky visited Mike and I at Populous Studio to contribute Steel Pedal to a couple of Mike's songs. Beautiful work. ​Soon announcing date/venue and opening submissions my annual festival now in it's 5th year. 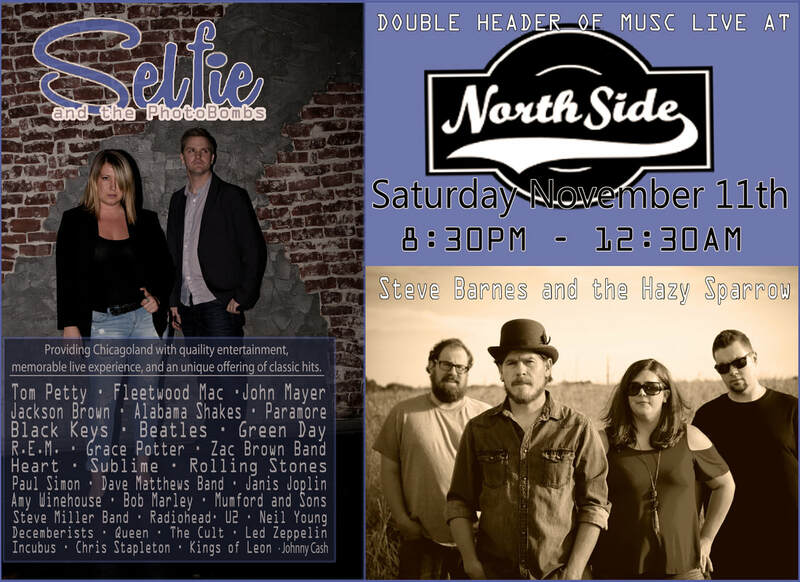 New show announcement with Aaron and Courtney's singing acoustic duo, Selfie and the Photobombs. Saturday March 10th in Elgin IL. ​Aaron Williams & Michael C Hayes concert at BaseCamp on Jan 27th saw both new and old tunes from both sides. "Everybody Loves My Baby" and "Lonely Feeling" off the upcoming album The Ex_Files was performed with a full band for the first time since House of Blues spring 2016. "Oh Mindy" has won Best Original Song From A Film at The American Tracks International Music Awards. Ceremony held in Los Angeles on May 9th 2017. ​Oh Mindy was written for the independent film "Mind Over Mindy" starring Jim O'Heir and Larry Thomas. Directed by Robert Alaniz. Finally a place to document all my madness. 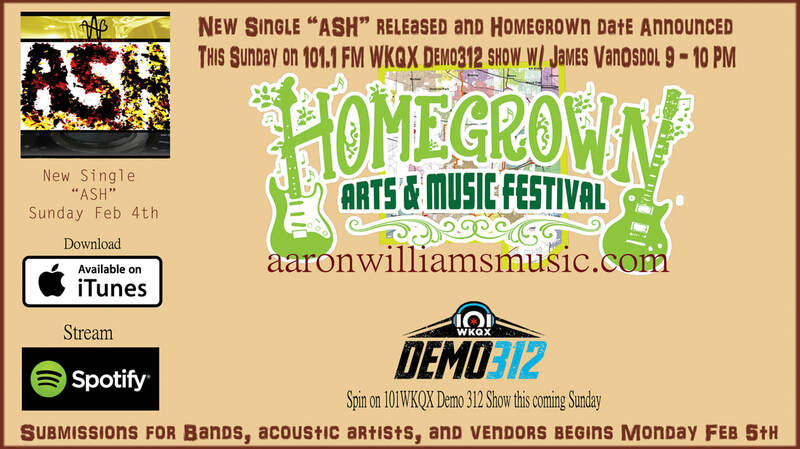 Stay tuned all year for new singles, new album, and the 5th annual Homegrown Arts and Music Festival, ROCK!